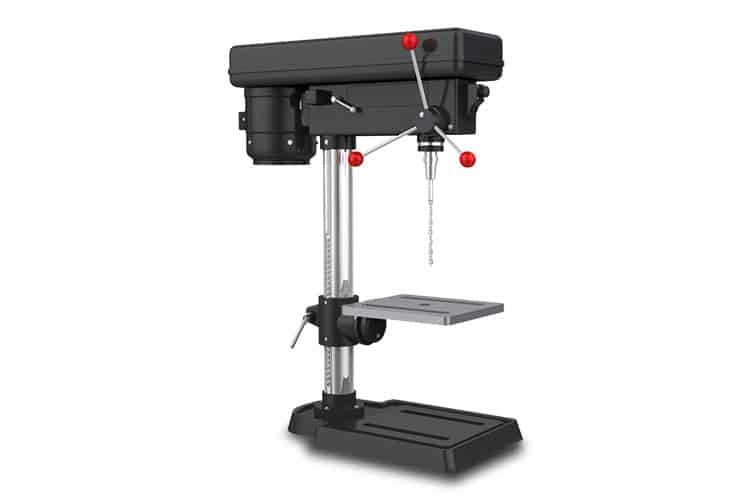 Whether you are a professional or a DIY woodworker, the most important aspect to consider is choose an appropriate drill press for the job. The right drilling press will determine the accuracy of your woodworking projects. So here is a Drill Press buying guide every woodworker should consider before adding this important tool to their workshop. You may want to have a very strong understanding of how the machine works. Well, we’ll get to that. But, to start, knowing about the different types of drill presses is important! The stability of a machine base and a stable column with a supporting swivel form the main characteristic of the common drill press. Used for moderate to light work, it is operated manually or by a feed gear mechanism. This type of hand-fed machine, used as a moderate to light duty work, uses a belt driven spindle head. Also known as Mag Drill, these drills use a portable electromagnetic or permanent magnet base to clamp on to the workplace which is to be drilled. It is equipped with cutting tools for drilling holes in metals of varying diameter and depth. 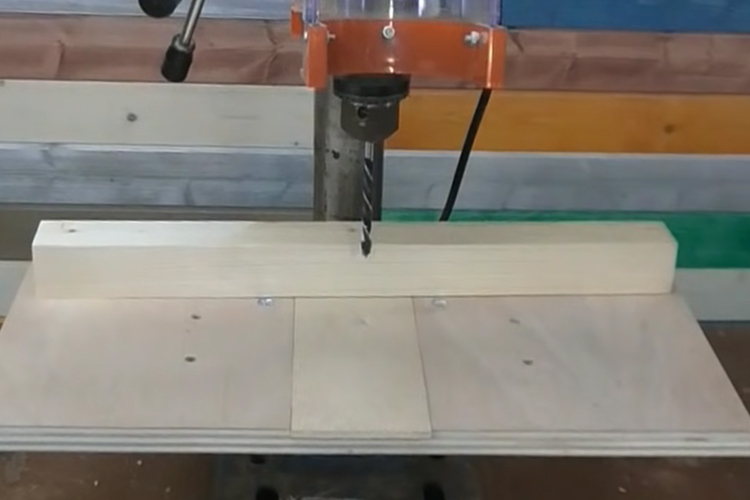 A radial arm machine consists of a base over which a column is mounted above which a radial arm fixed that moves along and adjusts to the height of the workplace. A drill head, which is placed over the radical arm governs the spindle drive and the mechanism of the feed. This type of drilling machine possesses multiple spindles mounted horizontally on a drum that cut the workpiece simultaneously into small pieces. It comes in two variants, Vertical and Horizontal. This type of drilling machine comes with a vertical spindle that is used mostly for metal working. They are used on a small scale in a small workplace. In an automatic drilling machine, when the toggle switch is pressed, the linear motor will move to the home position and the rotary disk will bring the workpiece to the position where drilling is performed and workpiece is disposed of and another workpiece loaded in a similar way. This machine is very accurate and time-saving. These machines are used for deep hole drilling, particularly used in gun making. The machines where the depth to diameter ratio is high, in such cases, this deep hole drill machines are used. They are also called as hand drilling machines, small in size and can drill approximately in the range of 12 to 18mm. Owing to their characteristic of handling very small parts, Micro Drill Presses are very accurate and come in high spindle speed. The chucks present in them, make them capable of handling an extremely small drilling tool. Several spindle heads fixed on the turret, wherein each turret is customized with a different type of cutting tools, forms the basis Turret type of drilling machine. What to Look for in a Drill Press? Engine size: High power variants will be more accurate and drill through tougher materials. The drill material and construction should be long-lasting, strong and solid for a durable drill. The base and table of the drilling machine should be ribbed and slotted as it will give a better hold for the clamping of the workpiece. The base table should be flat and easily adjustable from one height and position to another. Tapping is a process of creating threads in a drill so that a screw or bolt can be used to thread the hole. Counter boring process involves enlarging of one end of the tubular hole in a way that it forms a square shoulder over the original hole. This is done at a lesser speed than boring to fix the head of bolts or pins or studs. Countersinking is the process of making a cone-shaped enlargement at one end so that the flat head of the screw or the countersunk rivet can rest on it. It is generally done at 60 or 90-degree angles. When an existing hole is enlarged, the process is called Boring and the process that involves giving the finishing touch to the bore is called reaming. In simple terms, enlarging and giving a finishing touch to an existing hole is Reaming. Spot facing operation involves smoothing and squaring the end of the hole and the surface over which a screw or nut would be fixed. The spindles are mounted on the head as it is in the top half of the drill machine. The spindle action is produced by the Head as the spindles can only move upward and downward in a direction. This forms the main support over which the machine is mounted. It is usually ribbed or slotted to provide good support to the tables and is usually made up of a strong and durable material like cast iron. It is usually round in shape and also made up of cast iron to provide a strong holding to the table and the upper part of the drilling machine. The table holds the workpiece in the position and can be moved up and down and swiveled around the column in a horizontal axis. The spindles comprise of the entire rotary unit, including the shaft and the bearing involved in its attachment. They are a very important component in the drilling machine. As discussed above, the basic part that forms a part of any drilling machine is Base, Column, Table, Head, and Spindles. Depending upon the purpose for which the machine is being used, the size of the machine is decided. Considering the size, the base is mounted either on the floor or bench or table. The base supports the column vertically. The table can be moved in an upward or downward motion over the column. Not only the table but also the switches regulating the speed of the spindles that are mounted on the column. When the power switch is triggered, the power makes the spindles bore the holes in the workpiece that is mounted on the table. This is the mechanism involved in the construction of a simple drilling machine. The purpose for which the machine is being used decides the accessories that are needed along with the basic elements, the size of the drilling machine. The machine design can be customized depending upon the usability of the woodworker. The workshops will have a drilling machine larger in size as the workpiece will be of varying size. They are a salient feature in a drilling machine. Their variants, such as bits for glass or metal should be taken into consideration and thought of when buying a drilling machine. The power of drill bits is directly proportional. More the power of drill bits, more accurately the holes will be made. So for better results, one should not ignore this important feature. In areas with low light, an LED work light that is present above trigger will be very helpful for drilling in the right place and position on a workpiece to create a perfect drill. Some materials require more force and speed for drilling and some require less. So a dual gear mode helps sets the speed according to the toughness and the nature of the material. With a dual gear mode, the speed and torque of the drill can be governed which will be helpful in producing better holes. The lower gears can be used to fit in the screw as the low speed will minimize the chances of wood splitting. The more the operations available at the dialer, the better the torque and the angel will be for the working. The horsepower required to drill a hole of certain depth at a given speed rate are the determinants of the material removal rate. More horsepower is needed to drill a wider or longer hole. The more the power, the lesser the stress on the drill bits through hard material. More power indicates more durability and life of the drilling machine which makes drilling more easy, effective and accurate. Speed should be customized depending on the material because all materials don’t require the same power and speed. The spin rate of the machine is an important tool and it is measured in rpm. Nowadays, drill presses come with a lot of adjustments including angle and inclination systems for some very special work pieces. Some workpiece may be flat, some curved; so depending on that, a table that can be flexible yet strong is desirable. The torque at which the drilling to be done can be achieved. The inclination of the drilling machine can be set depending upon the size and the shape of the workpiece. This gadget helps in producing holes of the same depth. There are times when a number of holes are to be made in the same workpiece of the same depth, that’s when the Depth Stops comes handy for a user. The horsepower determines the rate of a drilling machine, so depending upon the purpose, you can go for a 24V drill if you own a workshop. For normal household works, a 9V or 14.4V drill is sufficient. Also, the drill bits play an important role in determining the price of a drilling machine. Certain accessories can be added to the design of the drilling machine depending upon the purpose and functionality. The accessories like drill bit holder, drill press clamp for holding the workpiece in the position and strong stand with rollers to ease out the working on the long pieces. There are many other accessories one can look for if drilling is to be performed on a regular basis. When you want to buy a drill, you have to consider all the aspects like where to buy a drill press from; what to look for in a drill press, accessories, horsepower, design and many other things. Whether you are a DIY worker or a professional, hope this Drill Press Buying Guide helps you make the right choice. 10 How to Use Tap and Die Set for Home Machines and Power Tools?